Aggressive surgical resection remains vital to the management of tumors of the pineal region. 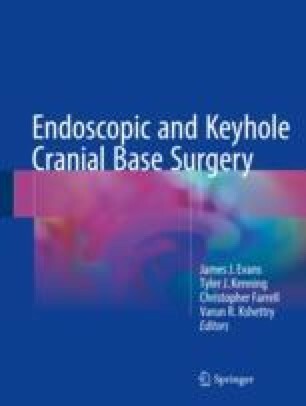 Surgical resection facilitates accurate diagnosis, the reduction of mass effect, and the management of associated symptoms such as hydrocephalus. Management strategies based on aggressive resection have produced excellent long-term outcomes for patients with benign tumors, as well as improved outcomes in patients with malignant tumors. Modern neurosurgery employs several adaptable surgical approaches to lesions located within the pineal region. Choice of surgical strategy must consider the relevant associated anatomy, the natural history of the various pathologies, and the goals of surgical intervention. As always, operative strategies should be tailored to the individual clinical presentation, with special attention to associated hydrocephalus, elevated tumor markers, metastatic disease, and the general medical condition of the patient. In 20.2, a variety of open transcranial approaches to the pineal region are presented and clinical strategies, potential pitfalls, and outcomes are discussed. The pineal region harbors many critical structures of the brain. Given the high risk nature of surgery in this region (as a spectrum of pathologies can exist in the pineal region, many of which require a gross total resection for a better chance of survival), critics would argue that a minimally invasive, keyhole approach is inappropriate. On the contrary, a keyhole mini-craniotomy approach is ideal for these tumors, as the targets are deep and the options for endoscopic exploration of CSF spaces are numerous. The trajectories to this region, similar to standard approaches, are from below or above the tentorium cerebelli. These approaches, discussed in 20.3, include the occipital supratentorial interhemispheric, infratentorial supracerebellar, and anterior transcallosal approaches. Preoperative radiographic characteristics of the various pineal region tumors and anatomic configurations will determine the best approach, and this also is covered. We will also discuss the use of the endoscope to ensure a thorough and safe resection of pineal region tumors.